Well I'm still using 3Delight,cause I'm just not putting out the money for Iray,nope ain't doing it.Besides I like toony stuff so not totally into real looking stuff ......can't you fix any floating hair in post?? HI RAMMIE you still da bomb!! Load up Dawn or Dusk and then deselect the figure. Load in the hr2 or pp2 file, it will load at the bottom of the Scene list. NOTE: DO NOT MOVE THE HAIR prop, DO NOT! NOTE: IF it's a hair prop and the hair loads too high or too low or back a bit or too forward you will need to move and resize Dawn or Dusk to fit that prop pretty much perfectly. So in the image you see below (Alisa you may remember this prop as it's from Apollo, called the Blunt Cut ) it loaded in high and slightly backwards so using the Y translation dial I moved Dawn's body backwards (I turned off the top two layers of the hair in the Surfaces tab to make sure Dawn's head was were it needed to be. I then used the Scale all dial and scaled her body up to the correct height to match the height of the hair. b: Target: Scene Item: Converted prop name will be in the drop down, select that! Projection Template: You can play around with DVL's templates if you want but they are not necessary! General Options, leave at default and make sure and add a check mark to the "Reverse Source Shape from Target"! Keep the "Fit to Source" on and you can check the "Add Smoothing Modifier" if you so desire. Click Accept and let it run. The Hair SHOULD now be a figure parented to Dawn or Dusk's head. Next step, test the hair. Make sure it moves with the head nicely. NOTE: Medium short styles you will have extra bones that will cause unwanted deformation. So my suggestion is to go back to the Joint Editor. The bones will now be visible. Zoom in and go thought each bone EXCEPT for the main HEAD one, right click on it and and from the menu Delete> Delete Bone (I've not tried the Delete Unused Bones so that's up to you to try that, post if you've had good results using that). 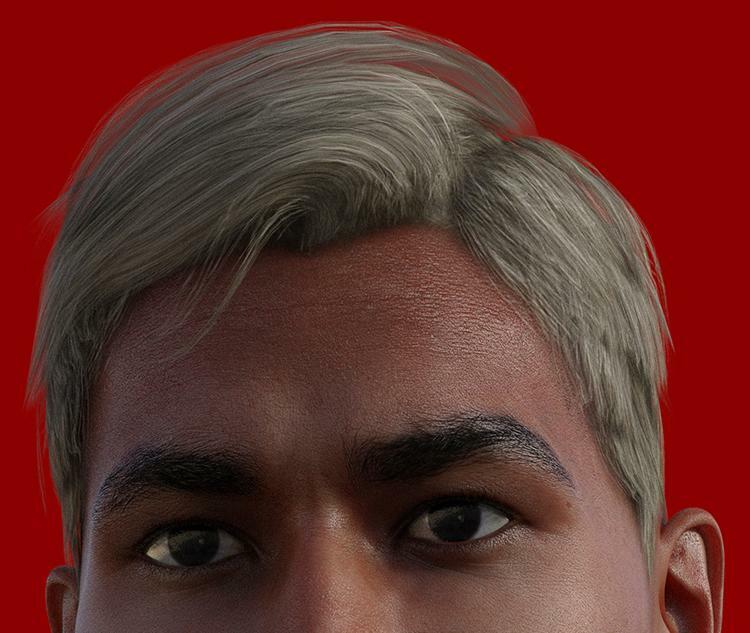 L'Adair aren't there hair shaders for Iray,you could use on the older hairs?? Yes. I should give it a try. I have OOT's IrayHair Pair Shader. Okay. 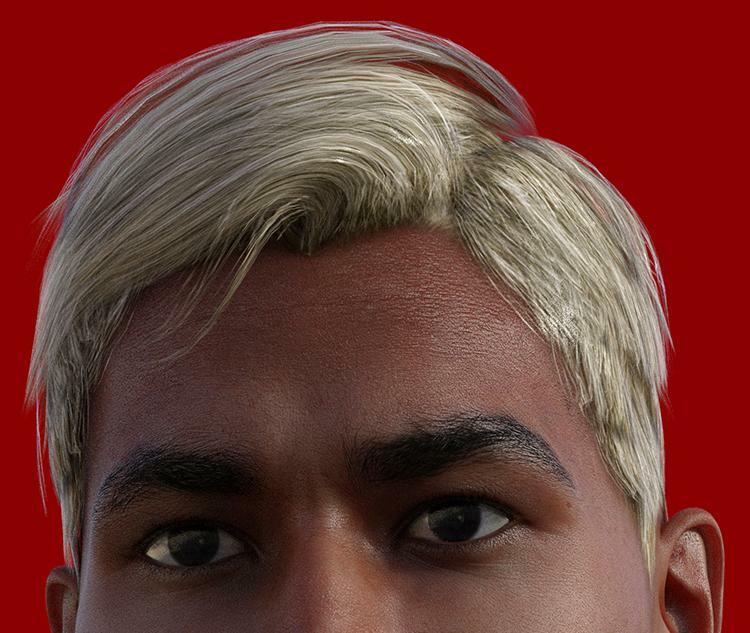 Here are three closeup renders of the hair. I used a dark red background with blonde hair so the empty space would be more obvious. While playing around with it, I did determine that from most angles, it's not obvious. And if the contrast between the hair color and the background is low, it also isn't as obvious. The first image is refit hair on G3M with only the Iray Uber Shader applied. The next image is the same, but with OOT IrayPair Hair Shader applied over the Iray Uber Shader. And the last image use OOt IrayPair Hair Shader and textures. Applying the textures from OOT's product didn't work that well. Closeup, anyway, you can see straight edges that should be strands instead. As it turns out GC Event is one of the small percentage of hair products that doesn't have the "UV-mapped in a straight, square format." Still, just applying the shader made a big difference. Just wanted to say this tutorial is the best thing since sliced bread. I can't believe this quick, easy method of converting all my old prop hairs to G3 was just sitting right under my nose all these years. Thanks so much RAM, tytyty. New to me baby! ;) And it's a gem, and so easy to do. Glad this old info still is useful hon! Thank you! Just found this and it worked a treat, saving me much wailing and gnashing of teeth!!!! So when are you going to change the thread title to "Fitting old hair onto newer figures"? ditto - I've been dodging this issue for years, using newer fitted hair, rather than fighting to get the old standards I had and love to fit... And bumped into this just now from another thread. Read this through end-to-end. saved pdfs of the works. Thank you RAMWolff and others who added their brilliance. Time goes by, but the questions remain. I suppose it was the title that threw me - I don't use zbrush, so I skimmed by. Silly me!